This winter continues to be an up and down affair. Cold and snow, thaw, cold and snow….But still we have not had the fridge temperatures of last year. Earlier in the week, as the snow on Lake Odonata was melting, I found the telltale tracks in the picture below. You can take a guess as to whom the tracks belong. I am not going to reveal it at this time, but I will surely be talking more about the “who done it” in February. 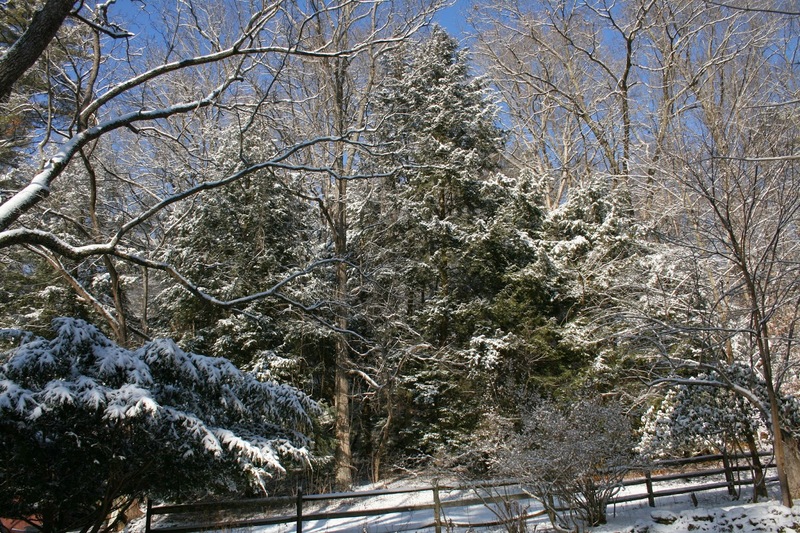 Just two days later the preserve was transformed from gray and slushy to a veil of white. The last thing I do in the evening each day is feed our resident Barred owl. This education animal is kept by special permit and is non-releasable due to permanent injuries. Some times I have to calm the owl down by doing a little imitation of her call – “who cooks for you“. Two times this week. when I did the imitation call, I was answered by a wild Barred owl! To which the captive owl responded with a “whooooooowa.” The wild call sounded like it was coming from the pine forest a short distance northeast of the nature center. Barred owls typically nest in late February,early March. Owls usually become more vocal as they approach the beginning of their breeding season. FYI, the Great Horned owls are most likely already on the nest or will be very soon. It may seem odd that these birds nest so early. But it is all timed so that by the time the chicks hatch, the weather will have warmed enough for food populations (like mice and voles) to be active again. Sounds like more snow is on the way, but hang in there, Spring is closer than you may think. Postscript: Five minutes after posting this entry, as I was walking out the door, an unprovoked Barred owl called from across the lawn, very near the nature center! Always exciting to hear the call of the wild!!! Enjoyed reading the blog postings…can't wait until the season opens!